analgesic, antibacterial, anticoagulant, antiseptic, anticoagulant, anti-fungal, antioxidant, anti-inflammatory, antiimicrobial, antispasmodic, antiviral, decongestant, diuretic, emollient, expectorant, hepatic, hemostatic, nervine. 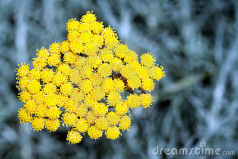 There are over 500 species of Helichrysum but the italicum species is the most rare and sought after for its range of healing properties and potency. The chemical composition of this essential oil is what makes it so rare and the climate and soil conditions effect it yearly which is why it is so expensive and sometimes not even available! This oil is highly versatile and can be used for a number or ailments, it is especially useful treating skin conditions and anti-aging as well as for first aid treatments and sports injuries. Add to beauty care products and first aid preparations. Use with care when pregnant and with small children.